To estimate the remaining life of existing RC bridge decks damaged by alkali silica reaction (ASR), multi-scale numeri-cal analysis with chemo-hygral model is integrated with visual inspection data at site. First, the applicability of the poro-mechanical models for ASR expansion in the multi-scale frame are examined with the experiments of the real scale RC slabs and the model is validated to bring about fair prediction of the 3D anisotropic expansion and the fatigue life of the slabs. Second, visually inspected cracks on bottom surfaces of RC decks are converted to space-averaged strains, and the magnitude of ASR is estimated from the vertical deformation, based on which the internal pre-stress and the damage fields are re-produced by numerical predictor-corrector cycles, and the remaining life of ASR damaged RC bridge decks is fairly estimated. By conducting sensitivity analyses in terms of ASR-gel volumes and cracks, allowable error range of site inspection data is clarified to meet the requirement of asset management. The aim of this study is to experimentally investigate the effect of drying on a shear wall, and to clarify the mechanism of the changes in the structural performance due to drying. Two sufficiently hydrated wall specimens are prepared. Then, one is loaded without drying, while the other is tested after sufficient drying until the shrinkage of concrete reaches an equi-librium state. The results show a reduction in the initial stiffness and little change in the ultimate shear strength in the dry specimen, in spite of an increase in the compressive strength. Reproduction numerical analysis using Rigid Body Spring-network Model (RBSM) coupled with a truss network model for moisture transport is conducted, and an ac-ceptable agreement is confirmed in the ultimate strength and the crack patterns. From the numerical results, it is revealed that two factors are balanced in the ultimate shear strength after drying in this experiment: 1) an increase in the com-pressive strength due to aging (material scale), and 2) a strength reduction due to lateral strain, which is evaluated using the formula suggested by Vecchio and Collins (1986) (member scale). This indicates that the wall reinforcement ratio and concrete shrinkage have the influence on the ultimate strength through increasing/decreasing the number of cracks and the crack width. For performance evaluation of existing reinforced concrete members under irradiation conditions, a numerical code called “DEVICE” (Damage EValuation for Irradiated ConcretE), which takes into account the heat, moisture, and radiation transport coupled with cement hydration, is proposed. This code is composed of the established computational cement-based material (CCBM) model and the one-dimensional deterministic transport Sn code “ANISN”. In the proposed model, temperature-dependent irradiation-induced expansion of aggregate minerals and resultant strength deterioration of concrete are introduced. Currently, the knowledge and modeling of irradiation-induced expansion of aggregate mineral is limited only for α-quartz. DEVICE was used for evaluating the strength distribution of the decommissioned plant Japan Power Demonstration Reactor (JPDR). Compressive strength distribution in a concrete biological shielding (CBS) wall of the JPDR was obtained by core sampling, and the compressive loading test results were compared with the calculation results. This comparison proved the practicality potential of DEVICE to predict the concrete strength distribution in a CBS. In addition, concrete strength change and its distribution in a CBS of an anonymous two-loop pressurized water reactor was simulated by DEVICE. The contributing factors for the change in the distribution of concrete strength at the inner surface of the CBS are discussed. 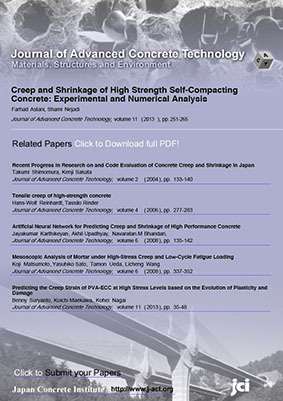 Furthermore, the ways of integrity evaluation other than the existing allowable fast neutron fluence method are proposed and discussed as follows: 1) mineral composition-based allowable fast neutron fluence; 2) strength prediction at the inner surface based on the expansion of mineral composition of aggregates and the lower limit curve of the ratio of compressive strength of the specimen after irradiation (Fc) to that of the reference specimen (Fco) as a function of concrete expansion; and 3) direct numerical calculation for seismic performance by considering irradiation-induced volume expansion and degradation of concrete. For estimating remaining fatigue life of RC bridge decks subjected to traveling wheel-type loads, presented is the data assimilation procedure, i.e., coupled life-span simulation with inspection data at site. Multi-scale analysis with hygro-mechanistic models is used for the platform of data assimilation on which the visual inspection of cracking on the members’ surfaces and the acoustic emission (AE) tomography are numerically integrated. For verification, the wheel running load experiments of slabs were conducted with continuous data acquisition of both crack patterns and the acoustic emission data over the life till failure. Visually inspected cracks are converted to space-averaged strains, based on which the internal strains and damage fields are re-produced by numerical predictor-corrector cycles. The 3D field of elastic wave identified by AE tomography is also converted to the fracture parameter of concrete. Although no information on cracking is available, the proposed assimilation method successfully reproduces most probable internal cracks over the volume of analysis domains, and the remaining life of the deck slabs inspected was successfully estimated.